With this, you can check Sansan information about yourself and your colleagues. 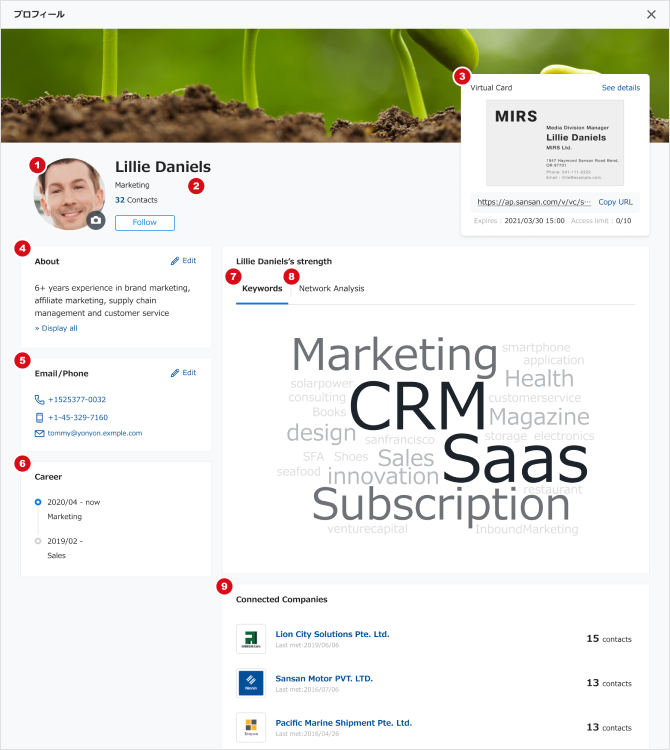 To better experience and understand business card sharing and the connections in your company, please give the User profile page a look. 1. Easily request colleagues to introduce someone they know. When you would like a colleague to introduce someone to you, you can contact that colleagueby using Messaging function from the profile page. By seeing the number of business cards and the ranking of companies whose business cards your colleagues have received, you can understand what they are working on and what companies they work most with. This will give you an image of what this person does in the company. By having your colleagues set their own business cards as such, other people can see what departments they worked in before and also what other companies they have worked in. * Individual users need to set cards as their own cards. The icon image will be displayed here. Here User Name, Department, and Email address are displayed. This shows the number of cards this person has registered. This show the top 10 companies this user has received business cards from. This shows your business card which you registered. When you click on a user's name, you will go to the User profile page.